In 1983, the DCI World Championships visited Florida for the first time, descending upon Miami's Orange Bowl Stadium, which four years ago was demolished to make way for the Marlins Park baseball stadium. Also, for the first time, Suncoast Sound made the Finals and the Garfield Cadets won the title, the first eastern corps to do so. A couple records were set that year, with Bridgemen making Finals after scoring 47.15 earlier in the season and a 20.65 spread between 1st and 12th place is the greatest in DCI history. The Cadets' show, though not the first one Hall of Fame visual designer George Zingali wrote for the corps, was the first production to highlight his concept of "flex-drill," which forever changed the art of drill writing. The second-place Blue Devils featured an electrifying high-note soloist in a Maynard Ferguson hit and Santa Clara Vanguard did the unthinkable by ending their show quietly with the last strains of "Appalachian Spring." Madison Scouts introduced new white uniforms and the Cavaliers celebrated their 35th anniversary with an original opener by yours truly. Phantom Regiment's entire fourth-place 1983 show was music by Russian Romantic composer Peter Illyich Tchaikovsky. The opening medley started with a short-but-huge standstill fanfare, based on opening from "Serenade for Strings," but much, much louder than Tchaikovsky could have ever imagined it. In reference to the work originally being written for strings, the color guard members caught their spinning flag poles and briefly treated them as violin bows. Right after that, the long, flowing red capes on the brass players were treated as visual shields to suddenly change the color scheme on the field. Performance excerpt of the 1983 Phantom Regiment. 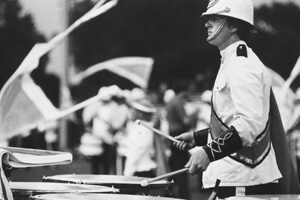 The 1983 Drum Corps International season in review. Discount DVD offer ends Monday, Aug. 27 at 8:30 a.m. ET.